The Adroit LDM-100 Labor and Delivery Mirror is a ceiling-mounted, remote controlled mirror that aids both mother and staff with the birthing process. When brought into position it provides a clear and comfortable view for the mom as her baby is born. When mom reaches the second stage of labor, the mirror is adjusted for optimal viewing using the handy remote control. It is positioned by the attending nurse in seconds and provides an unobstructed view over the doctor’s head. The LDM-100 mounts in a standard 2X2 ceiling grid between the surgical lights. 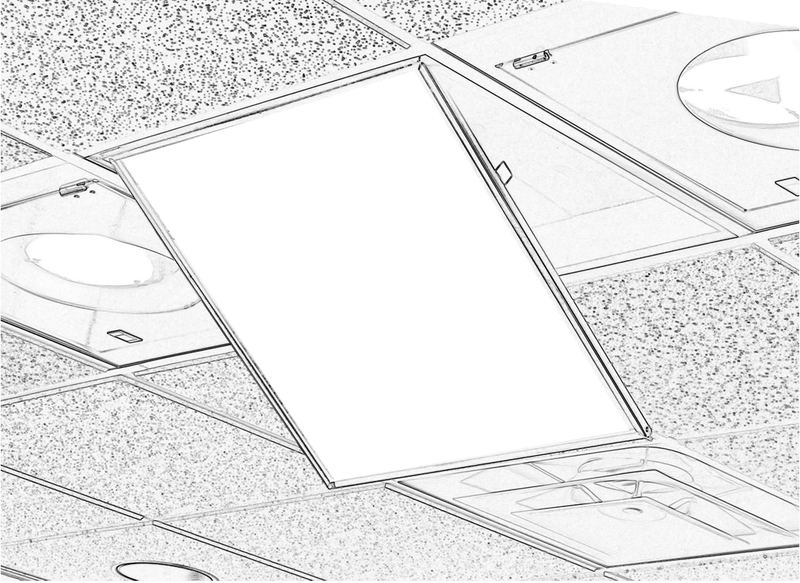 Concealed as a ceiling tile when not in use, it reduces clutter and congestion in the patient suite. The LDM-100 is easy to install requiring only 120 volt electrical connection and weighs just 24 pounds, making it simple for your facility staff or contractor to install. Additionally, it is easily retrofitted into an existing ceiling grid. Permanently mounted overhead, it is out of the way of the staff and overcomes every drawback of portable mirrors. When not in use, the mirror is retracted flush with the ceiling. No maintenance is required for the mirror unit. The remote control battery should be replaced anually. The remote control is furnished with a tether that is anchored to the headwall so the remote does not get misplaced. Remotes are digitally coded for each mirror unit so there is no interference with multiple unit installations. Mirror is acrylic, avoiding any possiblity of breakage. The mirror can be lowered to a nearly vertical orientation for easy cleaning. Use a non-abrasive, non-ammonia glass cleaner and wipe with a soft cotton cloth. Unit is sealed from the plenum for cleanliness. 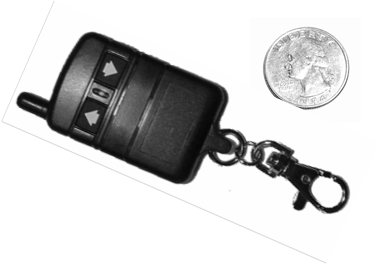 The key-fob-sized wireless remote control incorporates up and down control buttons and a tether hook. The remote control is powered by a standard camera battery and is user serviceable. A Cut Sheet detailing the product description, benefits and technical specifications is available as an Adobe PDF formated document. You may download this by clicking on the icons below. Adobe Reader is necessary to view these files. It can be downloaded free of charge from Adobe’s website. LDM-100 User and Installation Manualhe LDM-100 User and Installation Manual is available as an Adobe PDF formated document. You may download this by clicking on the icons below. Adobe Reader is necessary to view these files. It can be downloaded free of charge from Adobe’s website.